Below is a brief history of St Anthony's Church. At its peak, in 1970, the parish had a population of almost 2,700 and was one of the best equipped parishes in Belfast. During "the troubles", however, the church and its people suffered many attacks and setbacks, causing hundreds of parishioners to leave the area. Although a very difficult and painful time for all, the kindness and generosity of its neighbouring clergy and friends from different religions was very heartening. Today the parish is growing again and has a new multi-cultural congregation, including members from Poland, Lithuania, China, Africa and other countries. St Anthony's Church stands on the former grounds of Willowfield House, owned by Jonathan Vint, a prominent Belfast businessman. The house and eight acres of land were bought in 1906 by Most Rev H Henry, who was at that time the Bishop of Down & Connor. Plans to build a new church on these grounds were delayed by the outbreak of the First World War in 1914. Further turmoil, associated with the establishment of the new state of Northern Ireland, continued to delay the building plans. It was decided to construct a small rectangular building to serve as a Mass House until the Church could be built and this was later used as the Parochial Hall. Finally on 15th June, 1936, the foundation stone was laid by Bishop Daniel Mageean. The solemn opening of St Anthony's Church took place at 12 noon on Sunday 16th October 1938 presided over by Cardinal MacRory, assisted by Monsignor James Clenaghan and Monsignor Bernard Laverty. High Mass was celebrated by Bishop Edward Mulhern of Dromore and the special sermon was given by Bishop MacNeely of Raphoe. Bishop Mageean and Bishop Patrick Lyons of Kilmore were also present in the sanctuary. 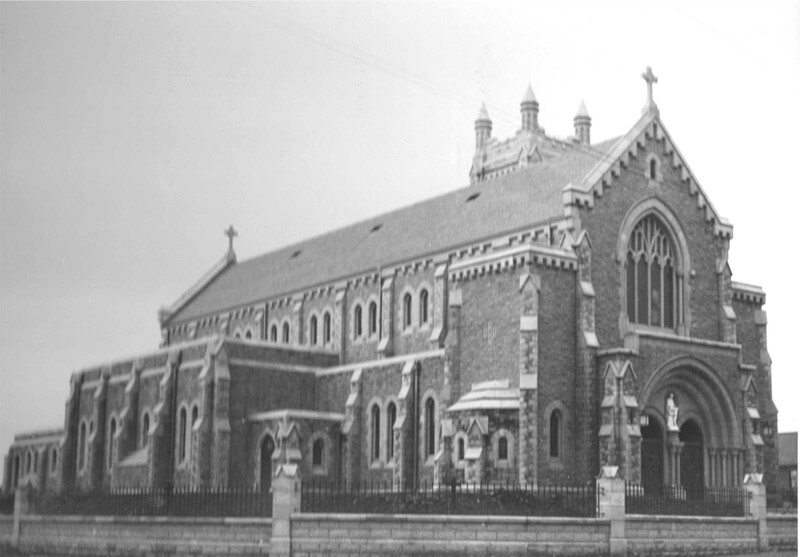 St Anthony's remained a "Chapel of Ease" to St Matthew's parish until 1955. During the second world war, in 1941, German bombers dropped incendiaries in Hatton Drive and Roseberry Road. After noticing that the stained glass windows had been shaken during this episode, they were removed into storage in the convent for the duration of the war. They were later reinstalled in the church. In this year St Anthony's became an independent parish. Fr. Patrick Fullerton, curate in charge since 1938, became Parish Priest and held that office until his death in 1972. In 1956, Fr Patrick Courtney was appointed Curate and it was decided to build a new parochial house for the two priests. This was completed in December 1957. Two intermediate schools were then planned for the Catholics of South and East Belfast. St Anthony's Parish were asked to contribute 10% of the costs. St Monica's High School opened in 1959 and St Augustine's in 1963. St Anthony's celebrated its Golden Jubilee in October, 1988 with a Mass of Thanksgiving. Bishop Cahal Daly was assisted by the parish priest and former priests who had served in the parish. A much smaller parish by then, it was filled to overflowing for this joyous occasion with many former parishioners returning for the occasion. 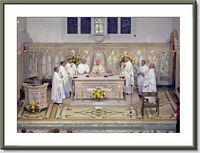 In October 1998, the parish celebrated its Diamond Jubilee. To mark the occasion, a week of festivities took place. These included a Parish Dinner Dance and an evening of verse recounting the life of St Anthony, given by the pupils of St Anthony's schools. The congregation welcomed their neighbours from other Christian traditions, to celebrate with them the joy of the Christian faith and heritage. On 17th October the Parish celebrated 70 years with a Parish Mass. The new Bishop of Down & Connor, Most Reverend Noel Treanor was assisted by the Parish Priest, Fr Stephen McBrearty. Afterwards, refreshments were served in the St Vincent's Centre where parishioners were able to meet the new Bishop. The Choir produced a new CD in honour of this celebration - "Jubilate Deo" and a copy was presented to Bishop Noel. The 75th Anniversary of the Parish was celebrated with a Parish Mass on the evening of 16th October. Bishop Noel Trainor and former Parish Priests of St Anthony's, Monsignor Macauley and Rev John Stewart concelebrated the mass with Fr Stephen. They were assisted by Rev R Fullerton (nephew of the first Parish Priest of St Anthony's) and Rev Krzysztof (representing the Polish Community). Music and hymns were provided by the Church Choir, arranged and conducted by the Parish Director of Music, Dr Skibinski. The Parish community has been strenghened in recent years by new members from countries all over the world, including Poland, Ghana, Lithuania, Romania & China. They were warmly welcomed to the Parish as were Clergy and neighbours from other Christian churches nearby. Fr Stephen expressed his thanks to all the Parish faithful, both past and present, for their generous support and dedication given over the past 75 years. Afterwards light refreshments were served in the school hall where many parishioners met up with old friends and neighbours. On 9th September, Bishop Noel Trainor made new clerical appointments in the Diocese of Down & Connor which took effect on Thursday 25th September. One of these involved St Anthony's Church where Fr Stephen McBrearty was appointed PP to Holywood and Fr Henry McCann was appointed in his place as PP to St Anthony's. Parishioners gathered in St Vincent's Centre on Tuesday 23rd September to say farewell to Fr Stephen after 18 years as Parish Priest.